This page is here to help you understand the evolution of the BMW Z3 WindScreens (mesh) and WindBlockers (clear acrylic). If you don't find what you are looking for or if you have any questions please give us a call on our toll free number. We are always available to answer your questions. WindBlockers/WindScreens can be a confusing topic. We have assembled this page to help you understand what options were available from BMW when your car left the factory in South Carolina and what options have evolved over the years. We haven’t listed them all, just some of the most popular options. 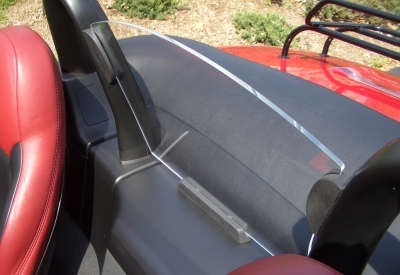 Here is the FIRST windscreen option that was available for the early Z3 roadsters. This version/type was an official OEM BMW accessory. This Type I WindScreen was available very early in the life of the Z3, probably the first 2 to 3 years. This option is no longer available. 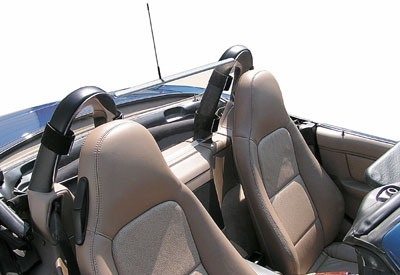 Here is the SECOND windscreen option that was available for the Z3 roadster. This version/type is an official OEM BMW accessory. 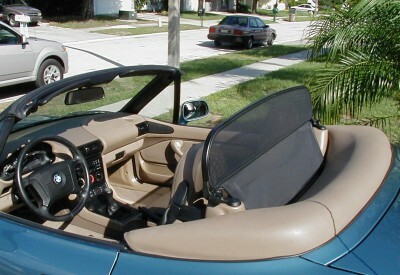 This Type II removable WindScreen was designed for Z3’s without roll hoops, 1996 and 1997 model years. If you have a Z3 WITHOUT roll hoops and want a WindScreen; this is your only available choice. This option is still available in very limited quantities from BMW and here at Roadster Solutions. Here is the THIRD WindScreen option for the Z3 roadster. This version/type is an official OEM BMW accessory. This was and still is a very good option. It performs extremely well. Some complain about the reduced visibility looking through mesh at night but this WindScreen has zippers on each side of the center panel that can be un-zipped allowing the center panel to fold down out of the field of view. This version installs over the roll hoops. 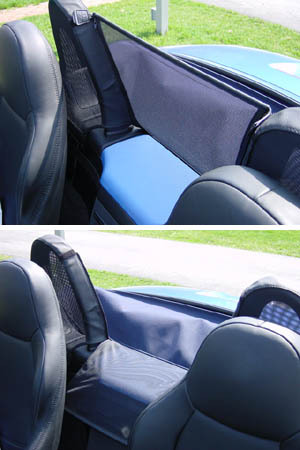 Here is the FOURTH WindBlocker option offered for the Z3 roadster. This version was/is very popular because the price is right and it is extremely easy to see through. It also disappears, making the roll hoops visible. Most owners like the look of the exposed roll hoops. Our version of this very popular WindBlocker has a bend in the acrylic at the top and bottom which gives it a lot of rigidity. It is available both in CLEAR and TINTED acrylic. It attaches with six low profile black Velcro straps that wrap around the roll hoops to secure the WindBlocker. This popular option is still available and can be purchased on our web site. Here is the FIFTH and newest WindBlocker option offered for the Z3 roadster. It is our design and is sold exclusively here at Roadster Solutions. This version is extremely popular because of its good looks and it is extremely easy to see through. It is made of see-through clear acrylic which makes it disappear and makes the roll hoops visible. It attaches with three rubber-like brackets that attach to the roll hoops and rear lower panel using a two-sided 3M automotive adhesive, just peal and stick. This extremely popular option is available and can be purchased on our web site. If you don't find what you are looking for or have any questions please give us a call on our toll free number. We are always available to answer your questions.